With Justice League arriving in theaters in just five short days, Warner Bros.' music division, WaterTower Music, has released the full Justice League soundtrack. We reported earlier this month that the Justice League soundtrack will include the classic Batman theme that composer Danny Elfman created for Tim Burton's 1989 Batman movie. Now you can listen to this theme and the entire 94-minute soundtrack below, the includes the individual themes for each of the six Justice League heroes, Batman (Ben Affleck), Superman (Henry Cavill), Wonder Woman (Gal Gadot), The Flash (Ezra Miller), Aquaman (Jason Momoa) and Cyborg (Ray Fisher). Warner Bros. released the main Justice League hero's theme last month, along with the full track list for this soundtrack, which may include some SPOILERS, so make sure to read on at your own risk. 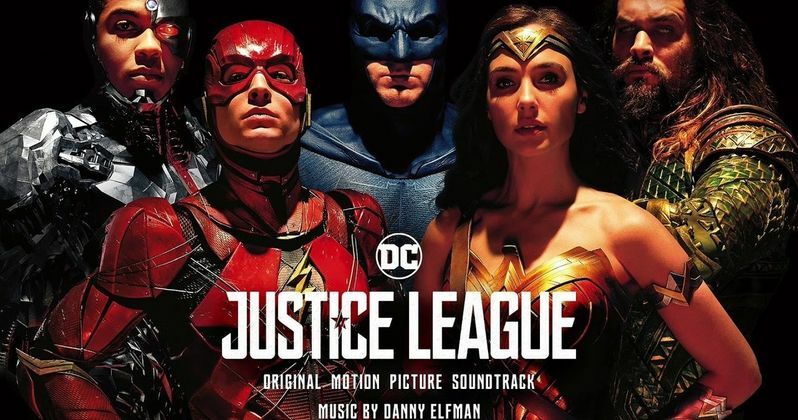 The track list includes "Everybody Knows" by Sigrid, followed by The Justice League Theme - Logos, Hero's Theme, Batman on the Roof, Enter Cyborg, Wonder Woman Rescue, Hippolyta's Arrow, The Story of Steppenwolf, The Amazon Mother Box, Cyborg Meets Diana, Aquaman in Atlantis, Then There Were Three, The Tunnel Fight, The World Needs Superman, Spark of The Flash, Friends and Foes, Justice League United, Home, Bruce and Diana, The Final Battle, A New Hope, Anti-Hero's Theme, "Come Together" by Gary Clark Jr. and Junkie XL, "Icky Thump" by The White Stripes, The Tunnel Fight (Full Length Bonus Track), The Final Battle (Full Length Bonus Track) and Mother Russia (Bonus Track). What's interesting is this track list does not include a song entitled "Unite the Seven" by Imagine Dragons, which was featured on a track listing for the soundtrack on IMDB before it was quickly removed. The phrase Unite the Seven has been used in marketing the movie before, with the phrase featured on the first image of Aquaman released by Zack Snyder, but there hasn't been much official mention of Unite the Seven since then. It was believed that the seventh member is in fact Green Lantern, who hasn't been officially cast yet, as far as we know. Still, it's strange that this supposed song was pulled from the soundtrack, but perhaps we'll find out more about this track after the movie hits theaters on November 17. Fueled by his restored faith in humanity and inspired by Superman's selfless act, Bruce Wayne enlists the help of his newfound ally, Diana Prince, to form the Justice League and face an even greater enemy. Together, Batman and Wonder Woman work quickly to find and recruit a team of metahumans to stand against this newly awakened threat. But despite the formation of this unprecedented league of heroes-Batman, Wonder Woman, Aquaman, Cyborg and The Flash-it may already be too late to save the planet from an assault of catastrophic proportions. It was also recently confirmed that Justice League has a post-credits scene, which Jason Momoa confirmed during a recent interview was actually in the script, which he calls "fantastic." The Justice League early reactions were quite mixed, although the full reviews are still under embargo by the studio, so it will be interesting to see how it fares with critics, especially after the critical and commercial success of this summer's blockbuster Wonder Woman, which many felt put the DCEU back on the right track. The movie is tracking to take in between $110 million and $120 million at the box office, but that may change over the next few days. At any rate, take a look at the full Justice League soundtrack below, courtesy of WaterTower Music YouTube.